Paul Tisdale said he was wary of crossing paths with Stevenage manager Dino Maamria... because of the Tunisian's broad shoulders. The Tunisian made more than 100 appearances for Boro during his playing career, returning as assistant manager to Graham Westley in 2013 before taking over as manager earlier this year after managing at Southport and Nuneaton. Maamria's history at Stevenage has seen him take on Paul Tisdale sides several times in the past, and the Dons manager said it is always a unique challenge to cross paths with him. "He's a wide unit, in terms of his shoulders, so in terms of crossing paths you have to duck out the way!" Tisdale joked. "But with his broad shoulders are a broad smile. For nearly 10 years ago, we've come across with Dino. He's at a club he has a lot of affinity with and he is doing a really good job. "You often see players or coaches become managers at clubs they have been at for a long time, and it's a shame when that turns sour. Dino took over last year and has done a really good job. 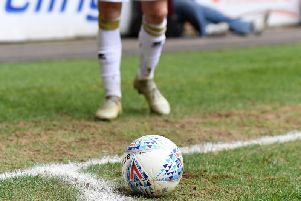 It's a really good step forward for Stevenage – hopefully it won't manifest itself with a win for them on Saturday, but of course I would say that!" Stevenage sit eighth in the table, having lost their last three in all competitions. Most recently, they were beaten 4-0 at Gigg Lane to Bury, with former Don Jay O-Shea bagging a brace. With Dons sitting top of the table, Tisdale says he has been impressed with Steveage this season and the way Maamria has set them playing. "I've been quite impressed with them so far. They've got a route to goal, which they have some threat with, and it makes any team of that ilk someone you have to look at seriously. I've spent an hour or two looking at them and I'm impressed with what Dino has done with the team – they look really competitive. I think they will pose a decent threat." Only 35 miles separate Stadium MK and the Lamex Stadium, and there has been little to tell between Dons and Stevenage down the years too. The sides have crossed paths 10 times since 2010, with Dons claiming the win four times to Stevenage’s three. Dons’ last trip to the Lamex Stadium came on the last day of the 2013/14 season. Stevenage led 2-0 heading into the final 10 minutes before Jordan Spence, Ben Reeves and Dean Lewington netted late on in Dons’ 3-2 win. Dons’ 2-0 win over Macclesfield on Saturday saw them take over at the top of League 2, going 10 games unbeaten in the league.